The Italian Trade Agency - ICE is the government agency that supports the globalization of Italian firms, under the strategies of the Ministry of Economic Development. ICE - Agency helps to develop, facilitate and promote Italian economic and trade relations with foreign countries, focusing on the needs of SME, their associations and partnerships. ICE-Agency sustains Italian firms in their internationalization processes and promotes worldwide the marketing of Italian goods and services, Italian investments, as well as the image of "Made in Italy" products around the world. Besides, ICE-Agency is directly involved in attracting foreign investments from abroad. Also it provides information, support and consultancy to Italian companies on foreign markets, promoting and fostering export and cooperation in all areas - industry, agricultural and agri-food, services etc - with the target of increasing and make more effecting their presence on international markets. ICE-Agency works closely with the Italian Regions, the network of the Italian Chambers of Commerce, business organizations and other public and private entities. The Italian participation at Maison & Objet was organized by the Italian Trade Agency in cooperation with CAN (National confederation for the Craft sector) and Confartigianato National Association of Artisans for Design and Innovation and Arts & Crafts. The home textiles stand hosted the excellence of Italian fabric production designed to satisfy the French market's demand. Some of the best Italian Companies taking part in the show were:- 1.Bababua:- Creating useful, healthy and durable furniture articles is what they do at Bababua. They produce furniture with handcrafted natural wood only and use water based varnishes to paint it in order to make it suitable even for children bedroom. 2.Atelier Intarsia :- It is a company which produces wallpaper entirely make by hand and custom - made decorations ensuring the exclusivity of each project. the company was founded in 1990 in Verona to offer a complete range of services in the field of interior decoration and design. The company can provide or restore fabrics, velvets, patterned carpets, furniture accessories ceramics, gilding and lacquering. 3.Made a Mono :- Made a Mono Italy stands out for its great ability to mix cultures, techniques and to process both ceramics and lava stone. It is the only design and manufacturing company which has been able to collaborate with major projects in Italy and abroad. 4. 13 RiCrea :- A team of three female designers established 13 RiCrea. They decided to use the synergy of their multiple talents to create furniture and decorations with an innovative and sustainable method of recycling industrial scrap materials like plastic, latex and felt leftovers. 5. Romono Bianchi :- Since, 1959 the company has worked with alabaster from the excavation of the stone to the last finishing touches. The company makes a wide range of decorative and lighting objects, including large lamps and chandeliers, wall and table lamps, vases, columns, candlesticks centerpieces and chess boards, all carefully crafted respecting tradition. 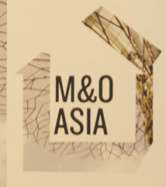 Presenting M&O ASIA (8-11 March, 2016 in Singapore) With its first two editions, MAISON&OBJET ASIA has seen a trend in its visitor profile that reflects Asia’s rapidly growing property development, real estate, and hospitality industries. 50 percent of the visitors to the 2015 salon were from these sectors, resulting in a visitor profile that is markedly different from that of MAISON&OBJET PARIS. With this in mind, the 2016 salon will see a greater focus on providing a more targeted showcase on interior design and architectural solutions for property developers, hoteliers, restaurateurs, interior designers, and architects. M&O ASIA 2016 will bring you: • Targeted business and networking opportunities with leading property developers, designers and key industry players from Australia, China, Hong Kong, India, Indonesia, Japan, South Korea, Malaysia, Philippines, Singapore, Taiwan and Thailand, etc. • First-hand knowledge and competition on the market development in Asia- Pacific.